Korean charms are much scarcer and frequently much more elaborate than Chinese charms. A visitor to my website recently asked if I could provide any information on this old charm which was purchased in Shanghai in the 1930’s. 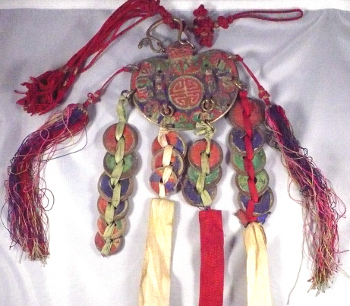 This is a traditional Korean charm fully embellished with tassels, ribbons and old Korean coins. 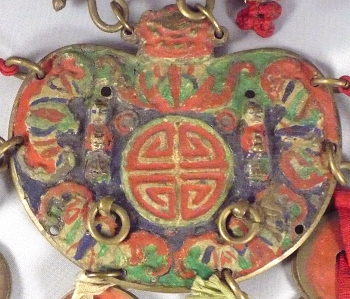 This side of the charm shows a large and very stylized Chinese character shou (壽), meaning “longevity”, in the very center. To the right and left of the “longevity” character are images of children. Around the perimeter of the charm are images of five bats with their wings highlighted in red. The “bats” are a visual pun or rebus. The Chinese word for “bat” (fu) has the same pronunciation as word for “happiness” or “blessing” (fu). The “five bats” therefore are a symbol of the “five happinesses” or “five blessings” which are: longevity, wealth, health and composure, virtue, and the desire to die a natural death in old age. 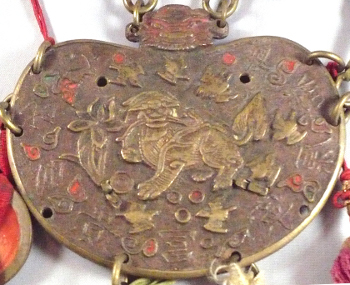 Korean charm displaying "lion", seven birds, and Chinese characters for "Five Blessings"
The other side of the charm has the image of a “lion” in the center. The image may actually be a “fu dog” which is a symbol of protection. Surrounding the “lion” are a number of flying birds which may be magpies. Magpies symbolize “happiness” because the first character in the Chinese word for “magpie” (xi que) has the same pronunciation as the Chinese character for “happiness” (xi). There are seven “magpies” depicted which may refer to the ancient love story of the Oxherd and the Weaver Girl. The two lovers were separated in the heavens for eternity but are allowed to meet each other once a year by crossing a celestial bridge composed of “magpies” on the 7th day of the 7th month. The Chinese characters for the “Five Blessings” are written around the perimeter of the charm. The coins hanging from the bottom of the charm are ancient Korean “sang pyong tong bo” cash coins which were produced during the years 1633-1891. While these coins do not display the year they were cast, many can be dated to a specific time period due to the mint marks and other symbols on their reverse sides. The charm is made of brass and was probably made sometime during the 1800’s although it could possibly be even older. This charm is an outstanding example of ancient Korean folk culture. These charms are beautiful! Thank you for sharing. I would call it a Chatelaine not a charm. While the Koreans actually call these objects “odd coins” (열쇠패) and the Chinese term them “charms” (花钱), these pieces are sometimes referred to as chatelaines in the West, as Shawn correctly points out. While it may be a term that Westerners are familiar with, I do not feel that chatelaine is really the best way to describe these objects. The chatelaine was an ornamental object worn at the waist that originated in Europe several centuries ago. It was a convenient way to carry such tools as keys, scissors, etc. The Korean piece discussed in detail in the article above served no such “utilitarian” purpose. Instead, it’s purpose was to bring “good luck”, happiness, longevity, fertility, prosperity and protection which are properties consistent with what we usually refer to as “charms”. When it comes to translation, it is frequently unavoidable to interpret things in terms with which we are familiar. However, in this case, I feel the word “charm” conveys the more accurate description of these beautiful pieces. I have one minor correction to make concerning the description. The two children are “Spirit Attendants”. They generally are shown carrying some symbol of longevity. In Korean they are called Dong Ja. Take a look at almost any Korean painting of the mountain spirit and you will generally find Dong Ja in the background. I collect Korean Chatelaines and have done some studying. Where can the symbols as pictured be purchased. I specifically am charmed by the 5 blessings with the picture of the lion. I’d love to know where I can buy it for a friend. I’m looking for Korean chatelaines like this. Aren’t yiu planning for selling this one?